Factory automation has long been a point of contention between labor groups interested in retaining manual labor jobs and management groups interested in increasing production output rates and lowering operational costs. That beer bottle inspection job once performed by Laverne & Shirley at the Shotz Brewing Company is today handled by computer-controlled, networked robots. Ever-advancing technology has significantly enhanced the ability to monitor and control processes that help reduce scrap, remove workers from dangerous environments, and create higher quality goods. YouTube is full of videos showing factory automation for all sorts of tasks from forming springs to machining intricate surfaces to performing final inspection measurements on electronic, mechanical, and pharmaceutical products. In the last decade the Internet of Things (IoT) philosophy has been adopted for factory control involving placing sensors and other kinds of monitoring (e.g., video, audio) to make access to and even control of data flow available from anywhere. Here is a look at the state of the art in the middle of the last century. By E. N. Arnold, Radio & Communications Engineer, The Timken Roller Bearing Co.
How one large manufacturer has come to depend on electronics in running his business - and how the important tasks of service and maintenance are met. Editor's Note: The increasingly significant role electronics plays in other industries has brought correspondingly significant problems in its wake. Electronic systems must be maintained and repaired. "Out" time is costly. In some establishments, the supplier of the original equipment or other outside agency performs this essential service. However, as in-plant electronics becomes more wide­spread and complex, the trend to integral, full-time maintenance crews grows. Even where such a service team exists, there are many questions as to how it may be organized to do the best possible job. Answers vary with requirements, but it is useful to review any successful efforts . Thus we examine a large organization with, many plants, that has done an impressive job in this field. Today the phrase "industrial communications" is becoming obsolete because it no longer refers simply to the exchange of information. Aside from communications, all industries are making increasing use of electronics in the control of production processes for goods and services through the use of telephone, radio, ultrasonics, intercommunications systems, television - and other electronic tools. Many large manufacturing firms are improving operating efficiency through electronics. One such is The Timken Roller Bearing Company of Canton, Ohio, a world-wide producer of tapered roller bearings, removable rock bits used in pneumatic drills, and its own alloy steel. Fig. 1 - At each base station we find a main transmitter (right) and an auxiliary (left) in case of emergencies. This guards against "out" time, which is very costly. As to communications alone, the size and complexity of this company's operations call for an exceptionally effective program. Plants are located in the United States, Canada, England, France, Australia, South Africa, and Brazil. The largest installations, with which we are concerned here, are located in and near Canton, Ohio. The Steel and Tube Division's electric-furnace melt shop and much of the equipment for processing the ingots is located at Canton. Adjacent to the steel mill is the main bearing factory, which turns out a large part of the company's annual production of bearings. Two miles west of this installation is the company's Gambrinus plant, which handles both bearing and steel-processing operations. Although employing fewer people than the two Canton plant operations, Gambrinus covers a larger land area. The steel scrap storage area; laydown yards for finished bars, tubes, and billets; piercing operations; and heat-treating furnaces are some of the facilities here. The Gambrinus bearing plant itself is primarily involved with screw-machine operations. Electronics is particularly important in controlling the handling of materials. Most of the steel for the Canton and Gambrinus operations is moved by straddle carriers equipped with two-way radios. One such carrier can be seen through the dispatcher's window in Fig. 2, carrying an underslung load of steel. The radio units, licensed in the Manufacturers' Radio Service, operate on 153.08 megacycles. Material movement requests are telephoned to the radio dispatcher (Fig. 2) by various departments. Outgoing material from the respective department is taken to a lay down storage yard and its exact location is recorded by the driver. When another department is ready for this material, the latter calls the dispatcher by phone, giving him the location of the load and where it is to be delivered. The dispatcher calls a straddle carrier by two-way radio. Upon delivery of the material, the driver reports completion of the assignment to the dispatcher by radio and is given a new assignment. When the assignment calls for a straddle carrier to move into or out of a building, doors open automatically at the driver's command. Each carrier is equipped with a supersonic whistle and each door with a receiver tuned to the inaudible tone. The driver doesn't have to leave his vehicle. Using a simple system of written slips and visual boards, the radio dispatcher knows the location of all carriers and the jobs they are on. He controls the radio transmitter with a foot switch, leaving both hands free for recording orders. A "no-hands" telephone with separate microphone and speaker on the operating console receives incoming telephone calls. 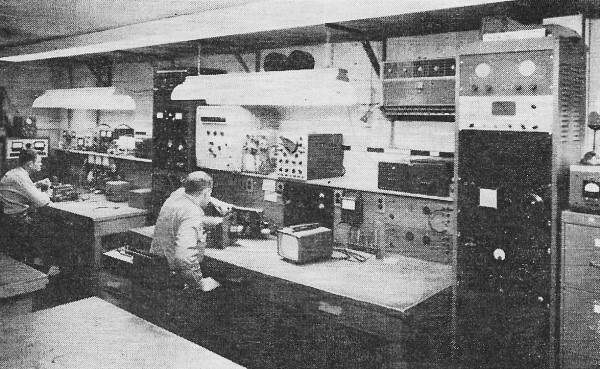 A 60-watt base station, located in an adjoining room, is remote-controlled by the dispatcher. Fig. 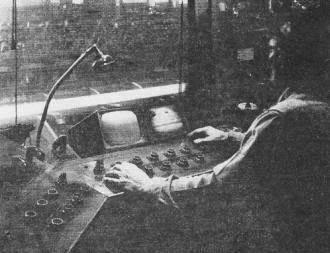 2 - The central material-handling dispatcher, located at the Gambrinus plant, directs the movements for a large fleet of vehicles. 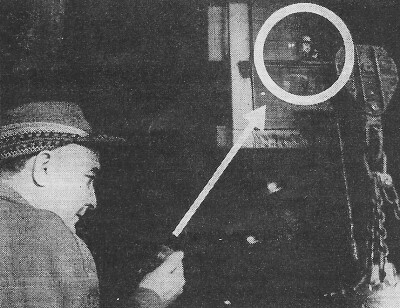 He is shown routing a straddle carrier, which is visible through the window of his booth. Obviously, failure of the dispatcher's radio, even for half an hour, would have a disastrous effect on production schedules. To counteract this, an auxiliary base station (Fig. 1) is located next to the regular transmitter. In the event of failure, the dispatcher throws a switch putting on the auxiliary and continues his work. A radio technician, who is on 24-hour call, is notified and steps are taken to put the main transmitter back on the air as soon as possible. In the event of power failure at the base station, an auxiliary, gasoline-driven generator automatically takes over. Since the supply voltage in an industrial plant often varies over wide ranges, depending on the work load, an electronic voltage regulator provides the radio equipment with constant voltage, irrespective of supply-line variations. 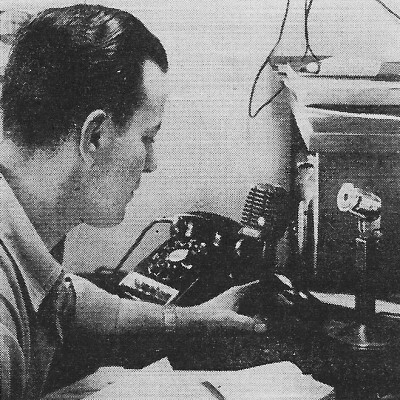 Two counters and a running-time meter automatically record the number of incoming radio calls, the number of transmissions, and the actual on-the-air times of the base-station transmitter. During peak load periods, three or more transmissions are sometimes made in a minute. Nevertheless, the use of codes to designate locations has succeeded in reducing actual air time to an average of about two hours for each 24-hour period. In addition to the straddle carriers, the dispatcher also controls the movements of three locomotive cranes, numerous lift trucks, service vehicles, and supervisory personnel in radio-equipped vehicles. Two-way radio contact with mobile units provides quick availability of material stored in outdoor laydown yards. This, in turn, frees valuable and expensive indoor storage space near the production machines which can then be used for production purposes. All scrap iron and ores used to feed the electric furnaces in the melt shop are stored at the Gambrinus plant and are transported to the melt shop by the company's own railroad system. Each of the diesel locomotives is equipped with radio. 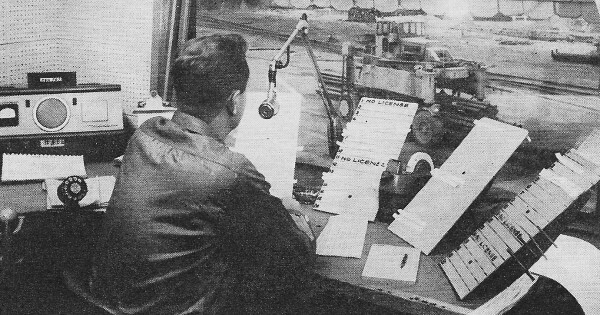 When radio was first installed on the locomotives, the operators complained of the constant chatter of the straddle-carrier operations and frequently turned the volume down or turned the set off. As a result, they sometimes missed calls. To remedy this situation, the remote-control unit located at the railroad yard office now keys a tone. A decoder on the locomotive radio then closes the audio circuit of the receiver and the message is received, but other messages are not heard. The receiver automatically mutes itself after each transmission by the engineer or, if desired, it can be muted manually. Each locomotive transmitter also keys a tone so that all railroad messages are heard by the other locomotives. Fig. 3 - This TV camera remotely observes the interior of a conditioning furnace. It is in a water-cooled case that swivels away for maintenance work. Each diesel locomotive is also equipped with a Citizens Band transmitter operating on 27.255 mc. This limited-range transmitter is used to operate crossing lights within the plant area. With this system, switch engines can work up to the crossing and then turn on the warning lights just as they intend to cross over. This eliminates traffic bottlenecks within the plant area and the need for watchmen at the crossings. The Timken Company employs a second radio system for the Traffic and Plant-Protection Departments. The Traffic Department, which is primarily concerned with the shipping and handling of material among the five plant cities in Ohio, operates on a frequency of 151.925 megacycles in the Business-Radio Service. This department has control of the company's highway trucks and provides such vital plant services as waste removal, mail and messenger service, and personnel transportation. Due to the distances involved between plant cities, a 600-watt input transmitter is used at the main plant in Canton, Ohio. The one-hundred-and-twenty-watt transmitters are installed at Columbus, Ohio (125 miles from Canton); Bucyrus, Ohio (90 miles distant); and Wooster, Ohio (35 miles from Canton). Radio contact is maintained with the highway trucks between plants. Seldom is a truck out of range of at least one of the base stations. The obvious benefit is efficient direction of these vehicles. After a truck has left a plant location, it can be re-routed to meet any emergency. Road conditions are carefully watched and, since several alternate routes between plants are available, a tie-up on one route can be reported so that other units can be re-routed. Basically the physical layout of equipment is similar to the Material Handling Radio System, with auxiliary standby base station and emergency gasoline-driven generator in case of power failure. An electronic voltage regulator is also employed on this system. Normal operations during the working day are handled by a dispatcher (Fig. 4) located in the Traffic Department's garage. A remote-control unit is also located at the plant-protection headquarters, where a man is on duty 24 hours a day, seven days a week. 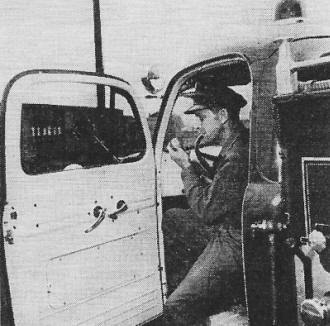 A radio-equipped fire truck (Fig. 5) and ambulance, and several plant-protection cars are handled from this point, as well as night-time traffic from highway trucks. Fig. 4 - The Traffic Department dispatcher is radioing instructions to one of the company's highway trucks. He operates one of two base stations. All control points of both systems and the radio repair shop are equipped with Conelrad receivers. Personnel are briefed on procedures to follow in case of an alert. Another communication problem which the company has solved through the use of electronics is one involving overhead crane operations in the steel mill. The old methods of contacting crane operators by means of hand signals and whistles has been made obsolete, oddly enough, as the result of air-conditioning. Formerly the crane cabs were open affairs exposed to the heat and fumes of steel-making operations. When these cabs were enclosed and air-conditioned for operators' comfort, it became difficult to communicate by the old methods. Carrier-current radio or wired radio was the answer to this problem. Operating in the l.f. band of 61 to 190 kc., signals are imposed on the 250-volt direct-current lines supplying power to the cranes and follow the lines with very little radiation. Floor units installed at strategic locations provide for quick instructions to the overhead crane operators. Some 45 of these units, operating on six different frequencies to avoid confusion, are in use (Fig. 6). Here again, the technicians provide round-the-clock service when necessary. A dramatic use of electronics is the closed-circuit TV system that guards the tube-mill conditioning furnaces. Five individual closed-circuit systems are employed in the Canton and Gambrinus tube mills. A camera mounted in a water-cooled case with a water-cooled lens system (Fig. 3) gives a view of the 1600-degree F interiors of tube-conditioning furnaces. This picture is transmitted by coaxial cable to the control-pulpit operator more than a hundred yards away. Any pile-up of tubes rolling into the charging end of the furnace or any misalignment could result in extensive damage to the furnace structure if not observed in time. With the TV camera showing the positions of tubes inside the furnace, the operator can quickly stop the movement of the tubes and have the pile-up or the cocked tube corrected. In another furnace used to cool tubes at a controlled rate after finishing operations, a TV camera is used to position the tubes as they roll into the furnace so that even stacks of four can be advanced through the furnace. The same control-room operator watches both furnaces at once (Fig. 8) by means of two TV monitors. Since the control pulpits are small and compact, it became necessary for the technicians to devise their own monitors. Most commercially available units have 10- to 21-inch screens with cabinets exceeding the size of home TV sets. Fig. 5 - This is a radio-linked fire truck. Other such vehicles include an ambulance, plant protection patrols, messengers, and mobile service trucks. Small home-type eight-inch TV receivers of the portable type were modified by removal of the r.f., i.f., and sound channels, making them strictly video monitors. Two of these units fit side by side on the control-pulpit operating desk. Since the screens are only about four feet from the operator, the picture is easy to view. 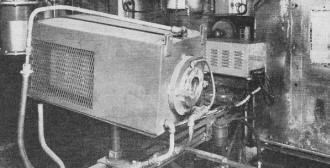 In addition, another TV camera in the Canton plant watches the loading of a car-type furnace, with the monitor several hundred feet away in the control pulpit at the discharge end on the opposite side of the furnace. The cameras used are of the image-dissector type, employing cold cathodes. These tubes happen to be very sensitive in the infrared region, making them ideal for observing furnace operations. Intercom and P. A. Systems Another important system of communications at the company involves industrial-type, high-power intercom systems, which link steel and tube mill operations. One such system extends for five city blocks and interlinks operations from the soaking pits and the 35-inch rolling mill to the 10-inch mill and wire mill. The soaking pits are actually installations for re-heating the cooled-off ingots sufficiently so that they can be rolled. Twelve stations, in all, are located at vital operations centers along the length of the steel mill, saving both time and walking. Each station consists of a master amplifier, a station-selector panel, a microphone, and a loudspeaker. The selector panel places power on the amplifier and at the same time ties its output to the loudspeaker at the desired location. A ceramic microphone in the selector panel or, in some cases, mounted separately is used to pick up the message. Ceramic mikes are used due to the heat and high humidity conditions encountered in steel-mill operations. Up to six conversations can be in progress at anyone time. Many benefits are obtained from this type of communications. A breakdown in mill operations can result in a pile-up of material unless the flow can be stopped. A quick call up the line can hold material until repairs are made. This is extremely important in handling hot steel, where the temperature for various operations must be maintained. Millwrights can be called quickly in the event of a breakdown and can be informed as to the nature of the break. This allows the millwright or electrician to bring the proper tools on his first trip. Supervisory personnel can also be located quickly by calling various stations on the system. Fig. 6 - A floor man guides the operator of the cab in an overhead crane in the steel mill through carrier-current radio. Hand signals are taboo. Intercom systems are also employed within an office or department. These systems can be adequately handled by small seven-station, selective-call, common-talk circuits. The phones are of the miniature, handset type, with station selection accomplished by a series of push-button selector switches. Many times outside calls request information on products or shipping dates. To avoid delay and the rudeness of a dead phone while information is located, a quick call on the intercom to a records-clerk or other source of information results in a rapid answer to the customer. These phones serve many areas where it is impractical or unnecessary to use the standard phone system hookup. A system similar to the police and fire-protection circuits used by large cities covers all buildings of the Canton and Gambrinus plants. Call boxes located throughout the plant must be tripped by the plant police on their rounds. A coded impulse is then sent to the headquarters building showing the exact location of the box pulled. 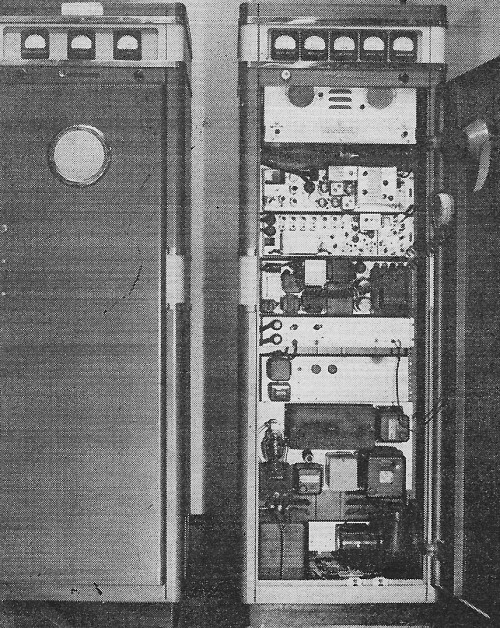 Voice communications with the officer is made by a phone circuit. Automatic boxes on the water-supply system feeding all automatic sprinklers trip if there is a flow of water from any sprinkler. Here again a coded signal is used to show the exact location of the fire (or accidental sprinkler operation). Fire-alarm boxes throughout the plant send a coded location report, when pulled, direct to the city fire department headquarters and at the same time give the alarm at the company operator's desk. In case of fire, a company police officer and company firemen are able to have plant gates opened and clear for fire-fighting equipment enroute to the plant. Responsibility for the continuous operation of company communications and electronics equipment is in the hands of a well-trained maintenance crew. A well-equipped maintenance shop, located at the Gambrinus plant (Fig. 7), is staffed with four experienced technicians. These men, primarily radio technicians, each holds an FCC license (radiotelephone 2nd class or higher). As might be expected, their hobbies also include amateur radio. Fig. 7 - This is just one corner of the electronic maintenance shop. A closed-circuit TV camera is being repaired. Equipment includes scopes, modulation monitors, deviation meters, frequency meters, wattmeters, and a WWV receiver. The author, who heads this service group, has a background of some 25 years in radio. He spent five years in naval communications during World War II and was employed as radioman for Goodyear Aircraft's airship (blimp) operations before joining the Timken Company. Floyd Leslie, Frank Dearman, and Floyd Baxter are veterans of military service. Leslie and Baxter were in communications and Dearman was in the Quartermaster Corps. All were employed in electronics before transferring to this communications service group. A radio-equipped electronic maintenance truck, with a compartmented body for parts storage, is used to answer calls for service anywhere within the plant area. Actually, very little repair work on electronic equipment is attempted in the field. Spare units are on hand for practically all types of equipment used and maximum interchangeability is the objective for all equipment. Replacement in the field followed by service in the shop is the preferred technique. Experience indicates that this is more practical than attempting to undertake extensive field repairs. Tube caddies are maintained at the shop for each type of equipment. They are always completely stocked with all the tubes and other parts, important to that particular type of equipment, that would be needed for on-the-job repairs. Most field repairs are confined to replacement of a tube or a blown fuse. If this fails to return the equipment to operation and a check of associated circuits outside the instrument itself (cables, switches, primary power, etc.) fails to locate the trouble, the spare unit is substituted and the defective unit returned to the shop. Here the equipment is given a thorough going-over and is restored to original performance standards. This unit may be returned to service or may, in turn, become the spare unit-depending on the equipment involved. In the case of two-way radio equipment, a defective mobile unit comes direct to the repair shop. Operational cost of heavy industrial mobile equipment is high - as much as $75 per hour in the case of a diesel locomotive - so it is important to return the vehicle to operation as quickly as possible. Great care is taken in the original installation of the equipment to secure and protect all cabling and associated control units - seldom is this part of the installation subject to failure. As with other equipment, repairs are normally not attempted on the vehicle. Instead, a spare unit is used to replace the defective one and, after an on-the-air check with the dispatcher, the vehicle is placed back in service. This usually takes less than five minutes. The defective unit goes on the repair bench at once and is given a complete check, irrespective of how minor the trouble. All tubes are checked, sensitivity measurements are made on the receiver as well as frequency checks. The transmitter is checked for power input, r.f. power output, carrier frequency, and modulation deviation. In most cases, when the equipment is placed back in the spare rack, it will meet or exceed original performance specifications. Fig. 8 - An operator in a control pulpit, who makes certain that steel tubes are in the right position, observes the course of this steel on two separate monitor TV sets. He keeps an eye on two conditioning furnaces at the same time. One hears much talk about periodic maintenance programs for electronic systems in industrial installations. No doubt, there are cases where such programs are necessary or desirable. Nevertheless, no pre-set maintenance schedule is attempted with the firm's electronic equipment. With this equipment in use 24 hours a day, any malfunction is quickly reported and corrected when it occurs. Also, a system of continuous monitoring quickly reveals departures from standards of performance. Important to this monitoring are remote-control units located in the repair shop. One facility they provide is that they permit technicians to listen in on the same receivers being used by the dispatchers in the base station, as well as their transmissions. In addition, the repair shop has two receivers of its own picking up all transmissions directly. Thus, if a base-station receiver should fail, transmissions from the mobile units will continue to come in on the off-the-air receivers, but will no longer be heard on-line from the dispatcher through the remote control. The failure of the base-station receiver is quickly recognized from this. Conversely, if the base-station transmitter should fail, messages will still be heard on the remote line but will not be heard on the off-the-air receivers in the shop. With this arrangement, a technician is often on his way to the base station before the dispatcher himself has realized that anything is wrong. The FCC requires that transmitter carrier frequencies be within 0.0005% of assigned frequency. In the 150-mc. band, this means within 750 cycles. Also modulation deviation is kept within five kilocycles. While measurements on each unit are required at periods not exceeding six months, there is no excuse for off-frequency operation during the intervals. 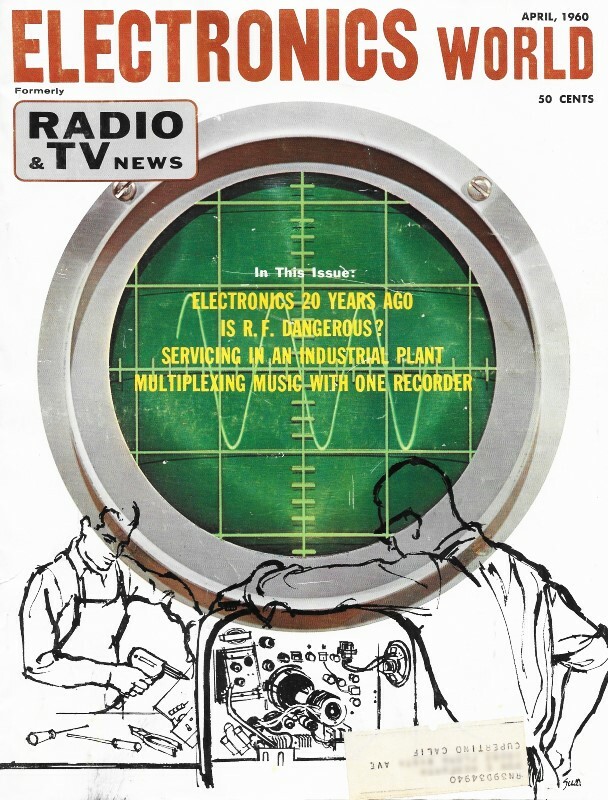 As a result, frequency and modulation monitors, kept in constant operation in the repair shop, are arranged so that they can provide off-the-air measurements of all local units. Any abnormal transmissions are quickly spotted and the defective units are ordered to the repair shop at once. The frequency-measuring equipment itself is checked frequently against WWV transmissions. Thus continuous rather than periodic maintenance is the rule. For those who may still feel that the lack of a prescribed routine for preventive maintenance may be shortening equipment life, there is an interesting point to consider: the service group, in existence for 10 years, has seen more and more equipment added during that period; yet 30% of the equipment it maintains today has been in continuous service for the 10-year period. The technicians involved are all salaried personnel operating as a plant service group, free to provide service anywhere within the company on request. This may involve anything from repairing a sound motion-picture projector to supplying and setting up a public-address system for a large meeting or banquet. 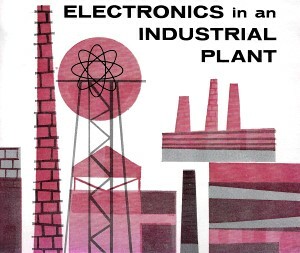 The company's industrial uses of electronics have grown and continue to grow rapidly. The scope of the system involved demands that the company maintain its own service department. The skilled personnel in this group have found their jobs to be challenging and rewarding. They make every effort, as part of the organization, to turn in top-notch jobs.